Terrorist attacks in quick succession have rattled Germany over the last ten days. Chancellor Angela Merkel has vowed that her country will rise to the challenge, while defending its open and tolerant society. It may prove her toughest fight yet. Rule 1: Don’t complain, don’t explain. Rule 2: The lady is not for turning. After eleven years in power, Chancellor Angela Merkel has demonstrated just how well she has internalized the rules of Europe’s other long-serving women, Queen Elizabeth II and Margaret Thatcher. Those rules served Merkel well this week when, in an indication of just how serious the situation in Germany is, she broke her third rule, interrupting her holiday to go before the press. Holidays in Germany are holy, and in the past, no matter the crisis she was facing, Angela Merkel always took her two weeks. But these are not normal times in Germany. In the space of ten days, a 17 year-old Afghan refugee attacked tourists on a train with an axe; an 18 year-old Munich native shot dead nine people before killing himself; and, within 24 hours of each other, one Syrian man killed a woman with a machete and another blew himself up with a rucksack bomb. In a final incident, an Afghan refugee escaped from a psychiatric facility and ran around Bremen shouting “I’ll blow you all up” before he was arrested and locked up again. 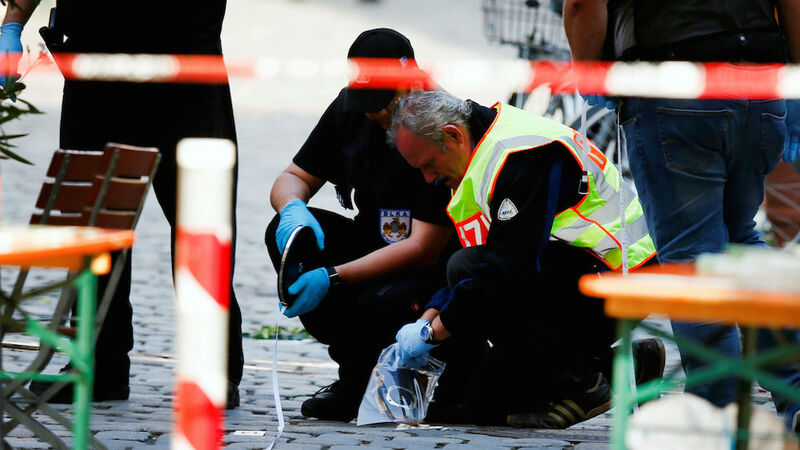 Four of the five incidents involved refugees or asylum seekers, two had links to the so-called Islamic State (IS) and, taken together, they ended a freak lucky streak that saw Germany spared the violence that has rocked its European neighbors. Though each case must be viewed individually, together they have rattled Germans’ confidence. A defiant Merkel appeared before the press to declare that Germany is “at war” with IS, and that she would not allow Islamist terror to undermine German values or force a change to her refugee strategy. “The terrorists want us to lose sight of what is important to us,” she said. Her challenge now: to shrug off growing domestic pressure to get tough on immigrants while restoring public trust and minimizing angst. It is important, she said, not to confuse cause and effect, to face down those whose terror campaign had contributed to the refugee crisis rather than turn on those fleeing the resulting terror. It was a classic Merkel performance – a cool, considered refusal to appear rattled, or to take any emotional bait offered by the journalists present. No, she was not exhausted by this latest crisis, no, she wasn’t considering standing aside, and no, she didn’t doubt for a moment that she did the right thing last year. Then, under the mantra “We can manage this” (“Wir schaffen das”), she urged Germans to welcome people fleeing terror in Syria and elsewhere. Over one million people came by year’s end. “I stand by the main decisions we made,” she said. “We have achieved a lot, even though these days it’s clear what we have yet to do.” Germany faces a new “challenge” since coming into the crosshairs of IS, she said. It was a typically Merkel understatement: the Süddeutsche Zeitung joked that if Merkel had been around in 1912, she probably would have called the Titanic sinking a “challenge”. But, like another iron-willed woman leader, Merkel is not for turning. She knows Germans’ willingness to welcome refugee has been cooling since New Year’s, when sexual assaults were committed by non-German men – including some asylum seekers – during celebrations in Cologne and other cities. Amid pressure from her political allies in Bavaria – on the front lines of the refugee crisis and the recent terror wave – Merkel presented a nine-point plan to improve the fight against terrorist acts and structures. Among the measures: a new body to decrypt Internet communication; additional security staff; a national migration register; and an early warning system to catch radicalized refugees. Again and again she refused to admit any failures in the last year; but, with an eye on limiting the damage, she also pointed out that all decisions she took were made in consensus with other political players, as well as the police and security services. Her Bavarian allies, the Christian Social Union (CSU), pushed ahead with their own post-attack plan on Thursday, promising tighter security measures and expedited deportations of failed asylum seekers, such as the Syrian man behind Sunday night’s bomb attack. “All our predictions have been proven right…Islamist terrorism has arrived in Germany,” said Horst Seehofer, the CSU leader and Bavarian premier, and a vocal critic of last year’s asylum measures. A year before Berlin enters election mode, as pressure grows on Germany’s left and right fringes, Merkel warned fearful Germans not to follow populists. A few isolated attacks by asylum seekers and refugees were “no excuse for xenophobia.” And though Germany was at war with Islamist violence, she insisted that this was not a war on Islam, distancing herself from far-right groups like the AfD and Pegida. It was an impressive performance in its sheer unremarkability – in other words, classic, low-wattage Merkel pragmatism. But will that be enough to face down Islamist terror, the greatest challenge of her political career so far?